According to the venue's website, Shipp will perform songs from his latest release, The Art of the Improviser, which won't even be out yet (it's due February 11). This will be a solo piano show. Because we live in an artsy town, it's up against some big guns: John Scofield at the Dakota, Kronos Quartet at the Walker, and area favorites Nathan Hanson, Brian Roessler, and Peter Leggett at the Black Dog, Atlantis Quartet at the Artists' Quarter, and the James Buckley Trio at Maude, among others. So it won't be an easy choice, but it's a choice we wouldn't have had before now. What's next, Loring Theater? A lot of people would love to see Vijay Iyer play here. Or what about the Vijay Iyer/Craig Taborn duo that played last October at Columbia University? Or Rudresh Mahanthappa's Indo-Pak Coalition. Or the trio Fly. Or Fat Kid Wednesdays, now that the Clown is just another basement. I understand you can't be a full-time jazz venue--it seems that nobody can these days--but something fresh once a month would be awesome. iyer taborn would be totally tight. but i did realize that after the clown closed a sweet 'new' place became available for jazzers. a monthly fat kid gig there would be incredible. It's a big house--it seats 440, which even the fabulous Fat Kids probably couldn't draw every month. But until they find a regular home, it would be great to see them there. Good news. Shipp played at the Walker with the David S. Ware Quartet back in 1998, but I don't think he's been back since. I think a monthly gig with Fat Kids hosting with other rotating groups as the first set would be a great bill. Plus, you are on the right track with Fly or Plunge from New Orleans. And good-bye to music at Cafe Maude beginning 3/1/11. 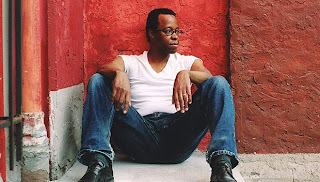 Shipp's work is very sophisticated, I think the appropriate comparison to Miles Davis, although his work does not have the same weight as the work of Miles, his sound is always seeking something new, looking to expand.